Are third-party printer inks worth the savings? With money in short supply these days, everyone wants to find a way to trim costs. One expense that could be on the chopping block—and one that Macworld readers repeatedly gripe about—is ink prices. Epson strongly suggests using its own ink with Epson-built printers. Printer manufactures strongly recommend using only genuine inks they’ve created expressly for that printer so that you can get the best results and avoid damaging your hardware. The problem: Printer makers also charge an arm and a leg for these consumables. Sure, they practically give away the printers, but replacing the ink cartridges one time, in the case of a six-color inkjet can cost as much as buying a whole new printer. Take the Epson NX400. This inkjet multifunction device cost $100 when we reviewed it a year-and-a-half ago. (And if you search for the best current price, it’s even less expensive.) 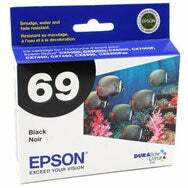 But replacing the NX400’s inks with genuine Epson inks will run you $58. It used to be that stores like Staples and OfficeMax carried generic inks that cost much less than the manufacturer’s own brand, but that is no longer the case. Thanks to lawsuits and deals, these office supply superstores carry only the name-brand, expensive inks. If you’re still looking for deals on ink, you can find them; you just have to look elsewhere—namely the Internet. I spoke to one online ink seller, Silo Ink, at last month’s Macworld Expo. Silo offers a complete set of refillable cartridges with 320-page yield per color for just $25. That’s about 8 cents per page. For $15 per color, Silo will sell you a 100ml bottle of ink that promises up to 4,000 prints, or 1.5 cents per page. That’s much less than the 17 cents per page that Epson charges based on its estimated yields of 240 sheets for an $18 black cartridge and $40 for a set of 420 yield cyan, magenta and yellow cartridges purchased at Staples. To get an idea of how Silo’s inks compared in terms of print quality and page yield, I bought a set of Silo cartridges from the company’s Website and a new set of Epson’s Durabrite Ultra brand inks for the NX400 from Staples. I then set out to print a lot of pages to see how output using Silo’s ink measured up to the ink recommended by the printer maker. Silo Ink’s cartridges feature two plastic plugs. Remove the colored plug before printing to let air flow into the cartridge. The Silo ink cartridges look the same as the Epson cartridges—except for the labels, of course, and two plastic plugs on the top of the Silo cartridges. After installing a Silo cartridge, you must remove the colored plug before printing to allow air to flow into the cartridge. The other plug is clear and is used for refilling ink from optional 100ml bottles. This clear plug remains in place while printing. The Silo cartridges snapped into place as expected, and the NX400 went through the cartridge charging cycle without incident. I did find that several cleanings from the Epson utility were necessary to get all of the nozzle test pattern to appear. One other quirk I ran into: Every 150 pages or so, the NX400 would stop recognizing a cartridge in the middle of a print job. When this happened, I’d open up the printer, remove and replace the same cartridge, and the printer would go back to work. A few pages later, the printer would stop recognizing another cartridge, and I’d go through the same process. Once all had been reseated, the errors would stop. Unfortunately, the printer doesn’t try and pick up where it left off on that interrupted print job; it just starts over. That may not a big deal when you’re printing a text document, but it happened twice about two-thirds of the way through a letter-sized photo on Epson Premium Glossy photo paper. It took three sheets, at about 70 cents a sheet to print that single page. 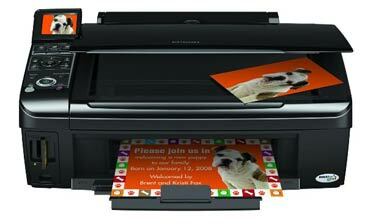 We used the Epson NX400 inkjet multifunction device in our tests. The cartridge yield estimates used by most printer manufacturers are based on the number of times a sheet with five-percent coverage of all inks can be printed from a single cartridge. Instead of trying to duplicate the manufacturers' test files, I used a more real-world mix of images for this yield test, printing 50 sheets of black text from Microsoft Word followed by 20 sheets of a color PDF printed from preview—both at default “normal” quality settings. I then printed three letter-sized photos on Premium Glossy photo paper using Epson’s Best Photo quality (a higher PHOTO RPM setting is available) from Photoshop and iPhoto and then started again with the text document. When the black cartridge ran out, I’d replace it and continue to run the color documents until the first color cartridge ran out. With the Epson cartridges, I was able to print 120 text pages, 40 color PDF documents and six 8.5-by-11-inch photos before the black cartridge ran out of ink. I replaced the black cartridge and was able to print 40 more color PDF sheets and 6 more photos before the magenta cartridge ran out. The printer also warned about low ink levels in the yellow and cyan cartridges. 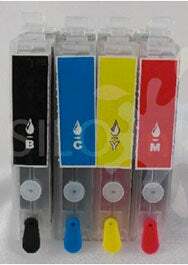 The Silo inks fared better, even though the color tanks were rated as having a lower yield than the Epson cartridges. I was able to print 160 text pages, 80 sheets of the color PDF and 9 letter-sized pictures on photo paper before the black ran out. I refilled the black cartridge per the instructions provided by Silo Ink. It was very easy and only a little messy. After the refill, I was able to print 109 more color sheets, 100 pages of the color PDF on plain paper and 9 photos before the magenta stopped showing up on the printed page. Note that Epson’s print utility doesn’t accurately show the ink levels in the Silo cartridges and doesn’t know when they've run out of ink. You can only tell by keeping an eye on the prints as they exit the device. Dividing the cost of the black ink cartridges by the number of pages each printed, I calculated a cost of 2.5 cents per page for Silo and 11 cents per page for the Epson black cartridge. Dividing the cost of the three color cartridges by the color prints they produced, I came up with 43.5 cents per page for the Epson and 9.5 cents per page for the Silo Ink. That adds up to 12 cents per full color page for Silo and 53.5 cents per page for the Epson. In Macworld’s review of the NX400, our jury found the Epson device to be very good at printing text, graphics, and photos. How did the same printer fare with cheaper after-market inks? It was a mixed bag. Text on plain paper was not as clean and crisp as it was using Epson inks, though as time went on and more and more pages were printed, the text quality did improve using the Silo inks to a point where it was difficult to tell the two prints apart. The same goes with our color graphics PDF—banding and horizontal lines were prominent in most of the prints from the Silo until after 100 pages or more were printed. Interestingly, the pictures printed on photo paper at Best Quality Photo settings were impressive. Red items in the photo (such as red peppers and tomatoes) were purplish-pink, but overall the photos were not bad at all. Skin tones were rosier in the prints using Epson ink, but not necessarily more accurate than the skin tones in the Silo prints. In fact the Silo ink print showed more shadow detail in some darker areas of the photos. Overall, even though plain paper print quality improved during use, I’d have to describe the Silo ink’s print quality as unpredictable and erratic. Add the quirks with the NX400 deciding to stop recognizing these third-party cartridges and the need for extensive print head cleaning, and you can see how it would be difficult to recommend these inks without some serious caveats. That said, I’m quite sure that the photo print quality of the Silo inks would more than satisfy 90 percent of users out there. Another 5 percent would probably be swayed by the low price as being good enough. Looking to save even more money? We purchased a package of Staples Photo Plus Gloss paper and compared it to Epson’s Premium Glossy Photo paper. Using Epson inks on both, three of our editors had trouble distinguishing any real differences between the papers, but when asked to make a choice, two of them chose the Staples paper, which at 45 cents a sheet in a packet of 50 sheets, costs 36 percent less than the Epson paper which cost us 70 cents a sheet in a packet of 50 sheets. One thing we couldn’t test was print longevity of these papers and inks. We’ll monitor the prints for fade resistance over the coming months and will report back should we find that the either paper outperforms the other. These are the findings from a single third-party ink supplier and one third-party paper using just one printer, so its hard to say how well other printers work with Silo inks or how well the NX400 would work with inks from CartridgeWorld. Should we look at others? Do you use third-party printer consumables? If so, let us know about your experiences, good and bad in the comments below.